Last Sunday we celebrated Mother's Day at VT and were able to have the whole family together! It was so fun to have a day to celebrate my sweet mom. 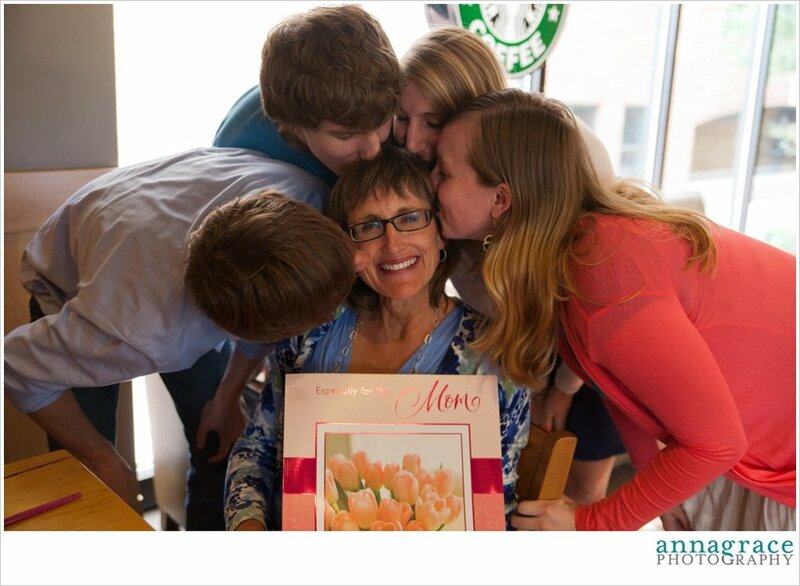 As the oldest, I have the special privilege of knowing my mom the longest out of my other siblings. It has been so great to develop an amazing friendship with my mom. I am so thankful for her! She does such a good job of caring and loving each of us individually. One of our favorite things to do together is cook! In case you didn't already know, my mom is an AMAZING cook. She is also really great at other things like caring for her friends and serving through Moveable Feast in the city. Every week she takes meals to Moveable Feast patients and has developed beautiful relationships with each of them. For Mother's Day this year, we gave my mom new pictures of us in frames that go up our stairs. The pictures from before were about 8 years old and needed to be updated! I took pictures of Austin, Erin and Luke while my picture was taken by the fabulous Katelyn James. My mom loved them! Enjoy these pictures from our Mother's Day, along with the before and after of the pictures in the frames!